Series - for maximum learning, please read all the guides in the series! To view the whole series, go here! This guide will show you how to create a custom export on your inventory. 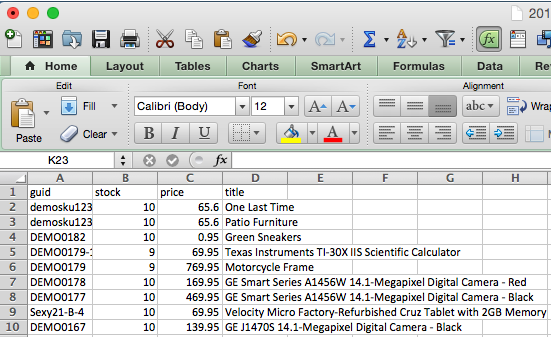 The spreadsheet you download from the export can then be modified and uploaded back to edit your inventory quickly; we ll cover that more in the next guide on Editing Existing Products in Bulk. 1. Go to Bulk Exports under Products"
2. 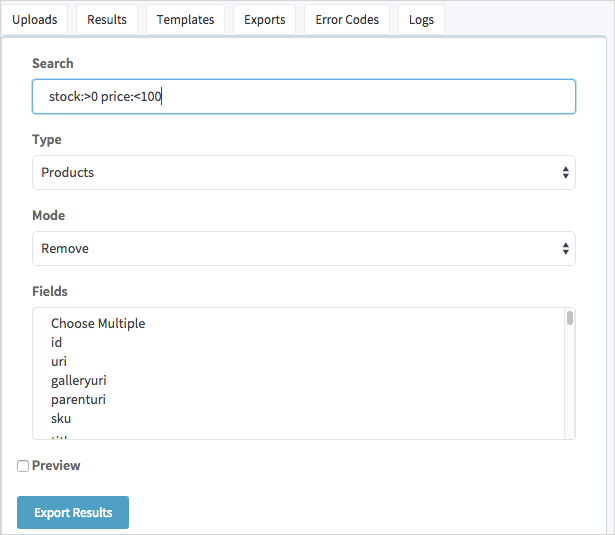 Type in a Search Query for the products you would like to export, these are the same search queries used for normal inventory search (see the guide here). 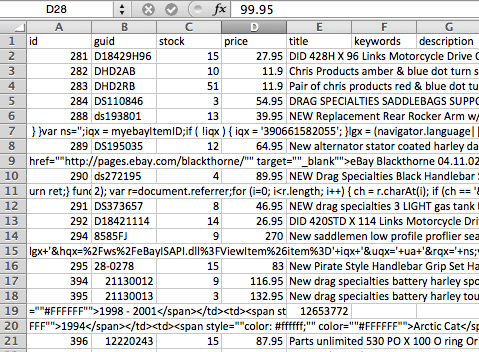 Note: If you leave the query field blank - it will export your entire inventory. 4. Highlight the fields you would like to include or remove from the export. If you choose Include, you can simply select the fields you want in the export. If you choose Remove, it is easiest to highlight all of the fields and then un-highlight the ones you want to keep unless you would like to export the majority. (Mac) and click on the fields you d like to keep. Tip: If you are going to use this information for an edit, make sure you include the GUID in your export so that your file will have an identifier to upload the products back. 6. Results will display at the bottom of the page - larger exports may take a few minutes to display. SureDone will automatically email you when the export is complete. Just refresh the page and download the file! 7. You can open the file in most spreadsheet application and it will include all the information you requested for the items that match your query! button on that page you can use. Tip: If you export file has a lot of messy HTML in it, or if the information seems to be shifted, try to do a custom export without the description fields - sometimes the commas and HTML tags can break the .csv file. at the top of the page. This will export all of the headers for this search. It s quick, but not quite as customizable. For a refresher on how to read this file, please return to the Guide on the Bulk File Format. For the next lesson, read the guide on how to Edit Your Products in Bulk.